Composer/arranger/bassist Anne Mette Iversen has issued a new CD, returning to a concept she first explored (on record) with 2008's "Best of the West" (BJU Records) and, that is, combining her ensemble with the string quartet known as 4Corners . Her group - John Ellis (soprano and tenor saxophones), Danny Grissett (piano), Otis Brown III (drums, cymbals) - has been together since 2005 and, with the addition of Peter Dahlgren (trombone) is now a Quintet. 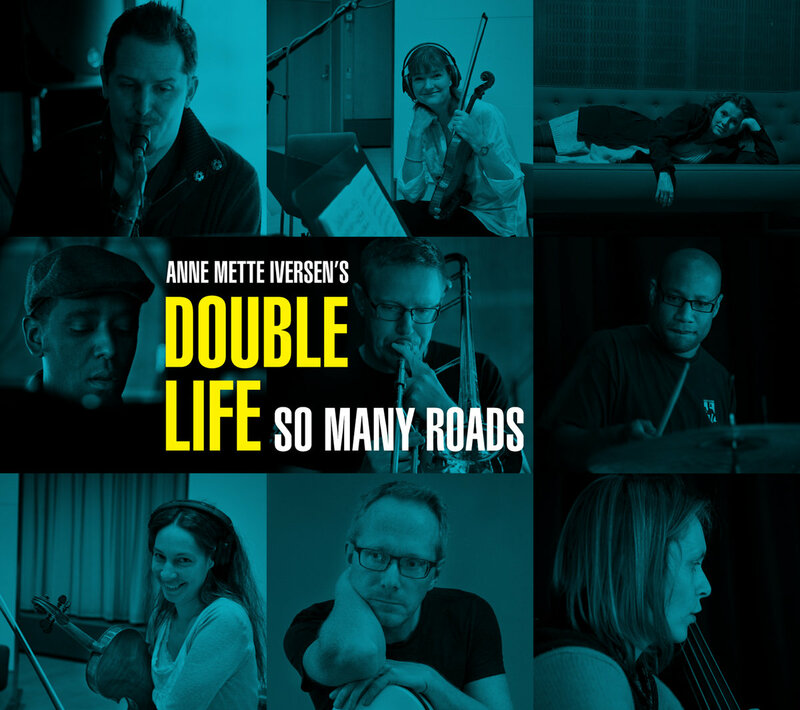 "Double Life: So Many Roads" (BJU Records) is her first recording since moving to Berlin, Germany in 2012. The music has much to offer the eager listener. Smart arrangements that blend the 2 ensembles, strong solos and ensemble playing from the Quintet, and, as one has come to expect, thoroughly involving melodies. The program features 6 pieces, "Prologue", "Chapters One - Four" and "Epilogue"; "Prologue" is Ms. Iversen alone, not something she does often on recordings, playing a 3-minute introduction that serves as a meditation, as a way to prepare the listener for the "Chapters". The melody line on the opening section of "Chapter One" is played by Ellis (soprano sax) with the string quartet, Grissett and Brown as counterpoint which dissolves into the saxophone moving in and around the furious string quartet. The next section into a waltz with Dahlgren's bluesy trombone leading the way as the strings slowly join in support. The piece closes with the ensembles joining for a short coda. "Chapter Two" is the longest track (10:41) and showcases the Quintet, with smart solos from Grissett, Ellis (tenor) and Dahlgren - 4Corners does not enter until past the halfway point, providing color behind the explosive drum solo, have a short section sans Quintet that sounds like their work on the previous, and then combine to take the piece out. "Chapter Three" is a lovely ballad, built initially off the interaction of the round sounds of the trombone and long notes of the strings (Brown III creates a quiet rhythm below with his cymbals like waves lapping the shore.) A tenor solo follows, evocative of Lester Young and Stan Getz, long flowing lines that fly over the rhythm section. Ms. Iversen also solos, with the strings adding their voices one-by-one until they have the melody only to drop out for Dahlgren to finish the piece by himself. "Chapter Four" takes off from the opening drum roll, stopping and starting for the musicians to play a short ascending line that modulates into a splendid call-and-response before Grissett takes the first solo. The string quartet spar with the drummer, their rapid phrases a strong counterpoint to Brown III's intense work. "Epilogue" is a short closing piece for the strings and piano, the Gershwin-like melody combining classical and jazz phrases feeling like a lullaby, an assurance that all is well. "So Many Roads" packs plenty of music and ideas into its 37 minutes. There are moments when all the elements combine that will catch your ears, that make one aware that there are 9 musicians creating a unified voice. Anne Mette Iversen continues to grow as a composer and arranger, writing for and working with musicians who she knows and trusts will not take the easy way out. Pay attention and enjoy! For more information, go to www.annemetteiversen.com. The previous CD from trumpeter-composer Erik Jekabson, "Anti-Mass", proved to be one of my favorites from 2012. A splendid collection of original compositions, the recording featured a delightful sextet that included saxophonist Dayna Stephens and violinist Mads Tolling. His new recording, "The Erik Jekabson Quartet & John Santos: Live at the Hillside Club" (Jekab's Music), comes from a October 2011 gig in the Berkeley, CA, nightclub that provides the title. Jekabson employs the same rhythm section as his past 2 CDs - John Wiitala (basses) and Smith Dobson (drums) - and adds the sparkling piano work of Grant Levin as well as percussionist John Santos. In a career that has spanned nearly 4 decades, Santos has worked with hundreds of great artists and leads his own sextet. When you listen to the 74-minute program, it's hard to believe this is the group's initial gig. Only 1 of the 8 tracks is under 7 minutes and that one, "Pent-up House", is so delightful one wishes it was twice as long. Santos's congas set the pace, the rhythm section locks into the groove and Levin takes off for the first solo - it's a doozy, filled with rippling lines and a sweet quote from "Strangers in Paradise." Jekabson picks on the energy of the piano solo and has fun with his solo. One can imagine people dancing in the aisles. Other highlights include the opening track, "Occupy", with its Herbie Hancock-feel (Blue Note years) in the descending melody lines. Santos and Dobson create a swirling rhythm section while Wiitala provides the structure. Levin leads the way in on "Fallen Angel", a sweet samba with the melody provided by the leader's flugelhorn. The pianist moves from supporting the melody to providing colorful backgrounds as well as a strong solo. It's fun to hear Thelonious Monk's "Rhythm-a-ning" with such a delightful Afro-Cuban feel. Levin's playful solo, employing most if all of the 88 keys, inspires the feisty trumpet solo played over the rhythm section each supplying quite a groove. "Actual Tune" also has quite a groove, a touch "down-tempo", with funky bass and drums; the leader employs electronic effects as Santos' percussion chatters and clatters in the background. Wiitala's simple yet strong electric bass lines offer a solid foundation for the rest of the group to play around. The CD closes with "Crescent Boulevard", with Jekabson taking a muted solo over his loops before the band enters on the rattle of hand percussion and piano chords. The trumpet sound suggest Miles Davis in the mid-to-late 1960s and there's more than a touch of blues in the melody. Levin shines here as well with a solo that pushes against the bass, drums and percussion. Jekabson's trumpet solo savors the rhythm, fitting his lines comfortably into the groove. It's a comfortable and amiable way to end the program. Erik Jekabson mined the art world for the songs that comprised "Anti-Mass" - here, he enjoys the groove, relishes the opportunity to step out as a soloist but does not skimp on melody. Yes, there's a lot of music on "Live at the Hillside Club" and one can easily get lost in the sounds. For more information, go to www.erikjekabson.com. It's been 3 years since the Danny Fox Trio released its debut CD "The One Constant" (Songlines Recordings). Together since 2008, this is a unit that plays with great joy - one can tell pianist Fox, bassist Chris van Voorst van Beest and drummer Max Goldman truly listen to each other, that they have fun pushing the boundaries, and that Fox's original pieces play to their individual strengths as well as creating a unique trio "sound. Just one listen to "Sterling", the opening track of "Wide Eyed" (Hot Cup Records), and you'll hear blues riffs, classical phrases, serious grooves, a touch of "prog-rock" and an overall funky feel. The title track, a ballad with a melody line that seems wistful yet distant. Once the bass enters, the piece has a more emotional feel. The mix of the bass lines with Fox's left hand pushes "Short Al in Brooklyn" into a frolicsome direction and there is a conversational feel to the piano phrases. "Funhouse Memory" has piano chords that, at times, remind this listener of Randy Newman, that soulful yet quirky feel the composer gets on certain pieces. There's the wondrous blend of circus and classical melodies on "All Tolled"; with van Voorst van Beest's bass holding down the beat, Goldman and Fox push the piece forward. The intensity gives way to a short bass solo before Fox digs in for a sweet solo. The classical piano opening to "Confederates" leads into an infectious beat (great brush work from Goldman, who also plays in Old Time Musketry and the Elan Mahler Trio) that jumps forward on full piano chord and a hypnotic bass line. No need to fear the "Drone" as the rolling piano lines set the tune on its relentless forward motion which stops short for a quick bass solo before the piano partners with the bass to ride out on the drums. The CD closes on "Tumble Quiet", which actually is a good description of the rhythms in this piece and the long descent of the piano melody. The Trio have this intense yet understated conversation before Goldman commences a martial beat and van Voorst van Veest plays counterpoint to Fox's dream-like phrases. The piece rides out on a short melody shared by the bass and piano before the quiet piano coda. "Wide Eyed" is satisfying on many levels; one comes away from numerous listens with great respect for the interplay of the musicians and how many of the pieces has such a strong forward motion. The Danny Fox Trio has taken its myriad influences and created a sound of its own. Good for them and lucky for listeners willing to go on this musical joyride. For more information, go to www.dannyfoxmusic.com.